Sometimes we just throw things away without knowing their real worth. With some knowledge about recycling and creativity, old things can transform into something more productive and utilizable. If we know the real meaning of recycling, we can make the correct use of such things and turn them into something new and innovative. Almost everyone uses computer and when it gets old, we just throw it into garbage. Luckily, some creative minds do not see old things as a waste only. In fact, they see it as raw material to make something new out of it. Here are some gadgets and sculptures that you will not believe are made of old computer parts. Vehicles from the Star Wars universe inspired an amazing creation of Sage Werbock, a blacksmith and a welder. Sage has expertise in making the robotic items out of old computer parts that people usually throw away. 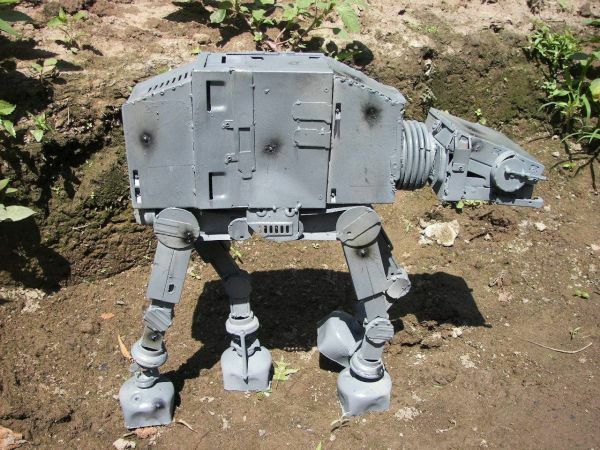 He built an AT-AT Walker that weighs around 15 pounds. While Sage has used power supply boxes to make the main part of the body, the head of the walker is made of floppy drive housings. Rest of the body is made of amazingly welded scrap. While one looks at the sculpture, no one could wonder that it is all made of old computer parts. Looking at this robot, we can learn to make the good use of the old computer parts. This robot stands tall and straight and looks quite cute. This robot is an incredible creation of Mike, who took all the spare parts of some old computers to create this marvel. Most of the body is created with circuit boards, which make robot look green. 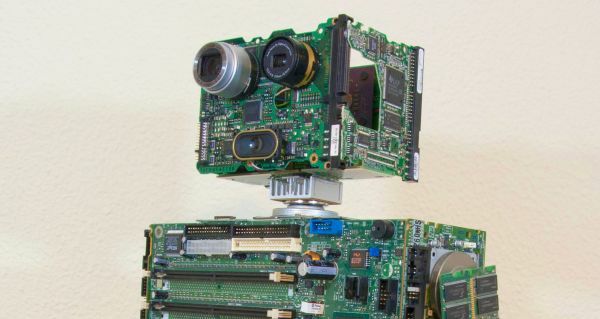 Mike has used old canon digital camera to make the eyes of the robot. Mike further uses some CPU drives and flash drives for making the brain of the robot. People might have seen wooden furniture a lot, but chair and tables made from old computer parts are something that deserves attention for sure. 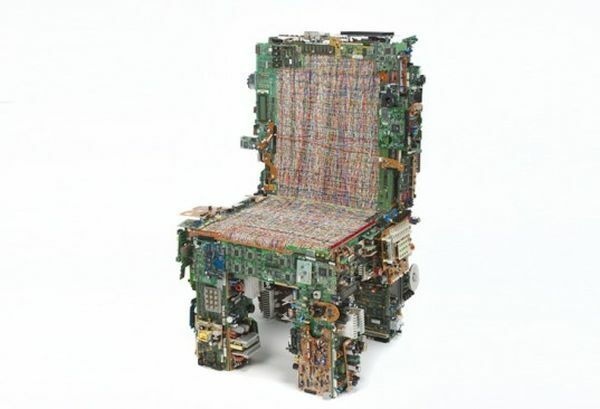 For making this chair, makers have used different parts of an old computer like circuit board, chips, and computer ribbon cables. Base of the chair looks strong, that can hold weight of a person sitting on it. Moreover, to provide the comfort seating to the user, they have attached a seat to the chair, which is made of computer ribbon cables. These cables are properly weaved in to the chair for making a comfortable seat for the users. Almost everyone likes to decorate his or her house with new and unique things. 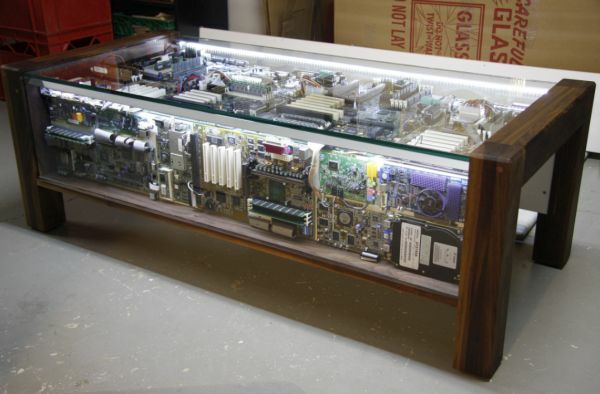 For making this table, makers have used glass and old computer parts to design this table. Old circuit boards and computer chips of an old computer form the interior of the table. Moreover, you can illuminate the coffee table, as it has lights inside it. Almost thousand of old computers go waste every day. Most people who throw them away do not know the correct use of these things. With better knowledge about recycling, we can save our environment from being polluted and shape old things into something new and unique.